Free woodworking plans to add storage to your house. Organize the clutter and show off your woodworking talent with these free woodworking plans anyone can build. 5 Free Woodworking Plans found in the "Household Storage" Category. Another quick and easy woodworking project. Set aside 3 hours on a weekend and you should be able to complete this project. According to the website, the plan is free, but the materials will cost you around $18. Lee's Wood Projects - How to Build a Wood Magazine Rack. 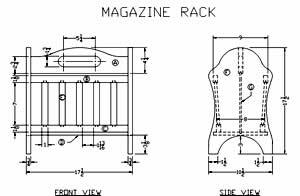 Building a magazine rack is a relatively easy project that can be completed in a few days. This free woodworking plan is very simple, but it's a wonderful way to display your wine bottles. The website says that this project will take about 3 hours and I tend to agree. It's a perfect weekend project that even a beginner can complete it that time. This is a very cool woodworking project design. It's a vertical wine rack that suspends your wine bottles in the air. The free woodworking plan on this site is very detailed. It has pictures, diagrams, and build instructions to help you along the way. Lee's Wood Projects - How to Build a Wooden CD Storage Rack. 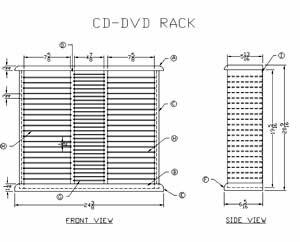 This attractive looking solid cherry CD-DVD Rack will hold 30 CDs and 42 DVDs.